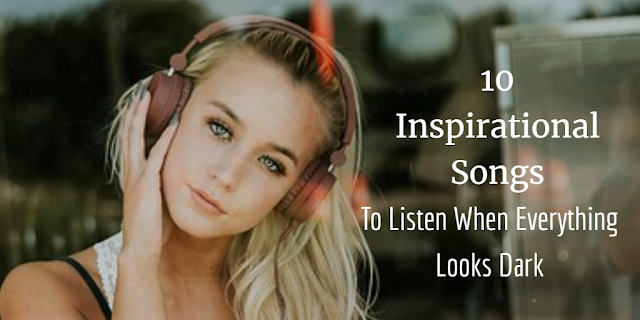 10 Inspirational Songs To Listen When Everything Looks Dark - Motivate Amaze Be GREAT: The Motivation and Inspiration for Self-Improvement you need! Everyone goes through difficult times and even many right now are going through rough periods. Adversity is a part of life and it is important to face it and never give up. Although these dark times are stressful, life draining and seem like never-ending, you have to understand that there is light at the end of the tunnel. Whether it is a breakup, the feeling of a failure, a diagnosis of disease or any other problem in life, you can actually face it and come out of it as a survivor. People use different ways to get through rough times. One of those ways is listening to inspiring music. When the legendary Mariah Carey released this song in 2002, no one had a slightest of the idea that she would open up about her decades-long battle with bipolar disorder in 2018. As she was first diagnosed with bipolar disorder in 2001, this song makes sense as she sings about how you can achieve anything in your life by not losing hope and having faith in yourself. She gives a strong message about fighting hopelessness to overcome dark times. According to Chester Bennington, this song was about children, mainly teenagers, how they face dark times and have no idea what to do in life. The message of the song is don’t think that the world is against you, just listen to your heart and don’t run away from situations. Katy Perry released this spectacular motivational song in 2010. She tells you to be who you are despite all the challenges in your life. She tells you to let your power shine and face the hard times with a clear understanding that low times will end soon. Paradise is one of the most inspirational songs of an immensely captivating and beloved band. This song is about how life can become so dark that it seems unbearable and yet a person can thrive with just hope in his/her heart. It tells that you can overcome difficult times with hope in your heart that you have a “paradise” to escape to. This song is all about never feeling that you cannot overcome life obstacles and challenges. The singer tells that you don’t need to rush things. If you’re going through a difficult period in your life or you have so many challenges to face, just calm yourself and solve one problem at a time. This song by Demi Lovato depicts how she was suicidal at a very young age and went through things that really changed her life. The song represents hardship and how a person can overcome the obstacles in life by fighting off fears and letting go of regrets. Nothing Else Matters is for people who’re facing difficult times with their relationships. It is about honesty and exposing yourself without any fears in your heart. It is about taking risks and doing what your heart desires. The song gives a message that it can be all dark and gloomy if you don’t take the risk. This song by Australian singer Sia took the world by storm upon its release and soon was considered as female empowerment song. It represents that there is no need to show your weaknesses to others and stay strong regardless of all the troubles in your life. The message is simple: stay and act strong and you will become an unstoppable and invincible force. In this inspiring song by Mandisa emphasis on asking the Lord for help when you’re into pits of darkness. The singer tells you to never lose hope and don’t think you can ask for God’s help tomorrow…instead, do it today. By trusting the Lord, you can have a better life without feeling you haven’t achieved anything. This amazing song is all about coming out of a relationship with someone. As in most cases, we tend to fall into depression in the aftermaths of our ended relationship. However, this song takes you through six stages that start from thinking your heart is broken into a million pieces to finally realizing that there were mistakes from both ends. This realization helps you to move on and live a better life. You have to understand that life is full of opportunities. It may seem like that all doors are shutting right in front of you, but you have turn things around by staying positive and not losing hope. It can be expected that these 10 songs help you overcome hard times, different obstacles, and life challenges. Stay strong, stay positive! WeiLe Ng is a music transcriber, musician and the owner of TranscribeASong.com offering YouTube to sheet music and chord chart transcription services.. WeiLe uses his decades of professional music knowledge and listening skills in order to get your favorite song transcribed.